Today’s photo presented a totally different challenge than yesterday’s photo—focusing on Kelly while shooting into a very bright light and properly balancing the bright ambient light with the power of the strobes. I selected a point at where I planned to take the photo and pointed the lights toward that point. I then set my camera to the exposure I wanted for the ambient light (which I wanted it to be slightly overexposed). Steve and I set a strobe on each side of the point and set the power to 1/4th power. We then had Kelly walk normally through our spot. I really liked the long shadows that Kelly cast on the ground. I think these shadows provide great leading lines into my subject and the shadows behind Kelly help lead the viewers eye through the rest of the image. Camera settings: Nikon D3, Nikon 70-200mm f/2.8 at 82mm, shot at ISO 200, f/8 and 1/250th of a second with a SB-800 at 1/4th power and pointed at model. Really cool photo. Love the backlighting and her position in the scene.The long shadows add a lot to the look. This was my favorite set up from the night, with the wonderful shadow in front of her and that cool alley. Unfortunately on all of mine she has unflattering cross shadows on her face and chest. I have been thinking about that for days and finally realized that I should have waited until she was closer to me to start shooting. You seem to have avoided those face/chest shadows here and she is just past the manhole cover. At first I thought maybe we should have used only one light and from more of a 45 degree angle than 2 at 90 degrees. 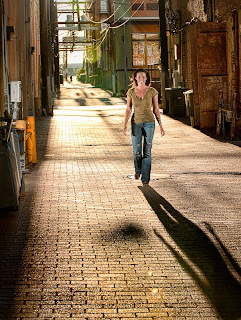 I want to try this set up again someday --- the alley, the sunlight, the model, what a great combination. I am sure she loves this shot too. My eye goes straight to the subject. All that clutter around her and you don't even see it unless you start looking around the photo. That's a successful shot. I like the shadows, leading lines and that light. Just a well exposed shot making great use of the off camera flash. Very striking photo. It get your attention and draws you into the photo. I would rate this one as a success. I like this one a lot. It is real eye candy. Your eye immediately moves to Kelly and then to her surroundings. Good composition and great color combinations. This one really strikes me as a unique portrait! Great light and terrific long shadows! Not sure whose idea this one was, but kuddows to whoever. Great shot. A lot of creativity with this photo. Enjoyed.